Found in many places, integrated into architecture and with a low-key look but a big impact - recessed wall luminaires near ground level are important lighting tools for ensuring safe passage on dark stairs, ramps and terraces. WE-EF has updated its range of steplights and added several new series. 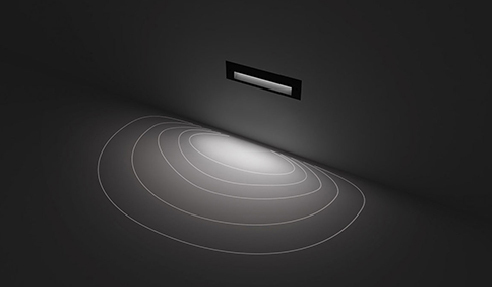 The new luminaires all work with a 5 W LED light source and have a slim, uniform design. They offer just the right variety of light distribution to perform a wide range of lighting tasks in all types of different installation situations. Found in many places, integrated into architecture and with a low-key look but a big impact - recessed wall luminaires near ground level are important lighting tools for ensuring safe passage on dark stairs, ramps and terraces. Elsewhere, they facilitate orientation by marking paths, or by reducing the risk of tripping up by illuminating different levels on platforms and terraces. STL134 LED / SVL134 LED / STO134 LED / STI134 LED Steplights. In addition to their functional strengths, they also offer impressive creative potential. Often used where gentle glare-free lighting and well-placed accents are required, recessed luminaires near ground level can be used to create atmosphere even at low wattages - be it on the roof terrace of a hotel, steps in a park or around a swimming pool. Furthermore, they offer interesting possibilities for accentuating or adding rhythm to architecture along paths and access roads as well as for lighting close to buildings. The new steplights from WE-EF, which are perfectly configured for these varied lighting tasks, offer three different distributions. In the STL134 and SVL134 series (horizontal or vertical mounting), the light is emitted through louvres. The STO134 (frame in corrosion resistant cast aluminium) and STO134 (frame in stainless steel) are equipped with a diffusing lens, while the STI134 series has an asymmetric 'forward throw' distribution. The optical system is particularly notable as it ensures glare-free visual comfort while at the same time providing very broad illumination of the ground. In the STI134, WE-EF combines a reflector element - which channels the light forwards and downwards in a controlled manner - with a lens that directs the light laterally. 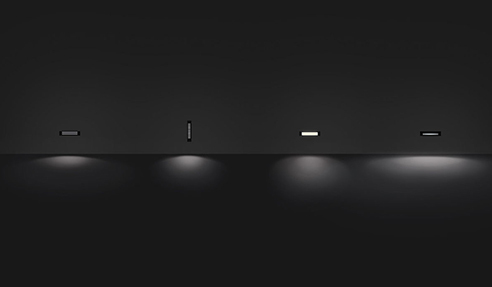 The new luminaire series all feature a rectangular luminaire cover with identical edge lengths of 270 x 65 mm. This allows different versions to be combined in one project. The reduced, elegant design - the housing measures only 120 mm in depth - has been made possible by LED technology. The WE-EF designers have succeeded in accommodating all components optimally in a very compact space. Simple assembly is nonetheless ensured. The luminaire is supplied ready for connection at the installation site and it does not need to be opened for installation. The electrical contact is made via a junction box. This procedure is also extremely practical when an installation blockout is used to install the luminaires in concrete. As with all WE-EF products, special coatings, screws and gaskets are used in these luminaires to achieve reliable corrosion protection and long service lives. Enclosures with protection rating IP66 safeguard the interior from the weather and environmental influences. In addition, thanks to IK impact resistance level 07, the entire range is well-protected against vandalism. Together with the long life of the LED light sources and LED drivers, these features ensure a long service life for the luminaires, thus guaranteeing safe passage for pedestrians and accented lighting for many years to come. For more information, head over www.we-ef.com. I would like to enquire about WE-EF LIGHTING.